There’s arguably no Premier League fixture that gets the nostalgic juices flowing quite like Manchester United vs Arsenal. The glamour fixture of much of the 90s and 2000s, this game might have lost its spark as both teams have gone a little downhill lately, but that doesn’t mean we can’t relive the finest players to grace this game in recent times. With that in mind, ahead of tonight’s clash at Old Trafford, we at CaughtOffside, and our good friend Dale from Man Utd blog Stretty News have put together our all-time combined XIs packed full of all the Thierry Henrys, Roy Keanes and Patrick Vieiras you could wish for. Simple 4-4-2 for me, Clive. Who needs fancy formations when you’ve got David de Gea in goal, and then ten of the best outfield players in their position in each of the remaining ten places on the pitch? Yes, I’m a slightly biased Arsenal fan picking Patrick Vieira over Roy Keane, but to be fair, only four former Gunners in total, which was painful. Leaving Dennis Bergkamp out feels particularly blasphemous on my part, but overlooking Wayne Rooney given his contribution to United and the Premier League in general seems criminal – and something most of my colleagues below should be questioning themselves over. In my opinion, there’s not nearly enough debate going on about the great full-backs to grace this fixture. While others may be content to simply lump in Ashley Cole and Gary Neville without a second thought, I’ve gone for something a little different. Patrice Evra – great player and character even before he started making love to poultry on the internet, and Lauren – the underrated hard-man of Premier League history who cemented legendary status at Arsenal for going for Phil Neville’s throat in this very fixture. VDS was phenomenal for years for United, has the record for most minutes in a row without conceding in the PL with 1032. Neville, Ferdinand and Cole speak for themselves really. It was either between Keown or Adams, had to go with Keown considering he was part of the Invincibles, won three PL titles and three FA Cups. Between Keane and Vieira, I just opted for the Irishman for his sheer longevity at Old Trafford and the trophy haul that came with it. Ronaldo, again, speaks for himself. Bergkamp was never really an out-and-out striker, always more like a centre forward/attacking midfielder, was also absolutely brilliant, one of the smartest and trickiest PL players ever. So many great strikers at both clubs, but for me Thierry Henry is behind only Alan Shearer as the best of all time in the Premier League, so has to be in there. It may tell my age but De Gea is the best goalkeeper I have seen play for United. And, you would be hard pushed to name a better defence than this one, especially when it features the formidable Ferdinand/Vidic partnership. 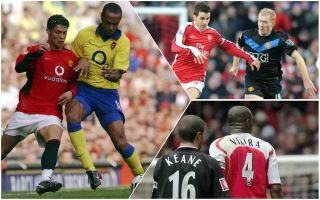 The midfield trio would take something special to match, even if it meant sacrificing some of the greatest footballers the Premier League has seen (Giggs, Beckham and Pires). I couldn’t pick between Keane and Vieira for different reasons, but Scholesly walks into every great Premier League team. Up front, Van Nistelrooy gets the nod ahead of Rooney, and with Ronaldo and Henry at either side no defence would stand a chance. A team so dripping in sauce it needs no explanation. A diamond formation to accommodate the immense talents of Keane, Scholes and Vieira, and Ronaldo pushed up front where he’s best. Schmeichel gets the nod between the sticks just ahead of De Gea because of his ability to command the box and his resolve in the face of adversity. The back four picks itself, with Cole being arguably the greatest left-back in Premier League history and Neville bringing his aggression and astute positional sense to the opposite flank. Stam and Ferdinand would surely have complemented each other beautifully, as the former marshalled the back four like a general while the latter was not only an a great defender, but an assured technical footballer. In the middle of the park Keane and Vieira were two of the all-time great midfield enforcers and with pass master Scholes sitting in front of them, their combination as a trio would have been perfect. Ronaldo and Henry are probably the best two foreign imports to ever grace English football. Together they would have been unstoppable and with the apex penalty-area predator Van Nistelrooy feeding off their individual brilliance, this front three would have guaranteed goals.